The Nichelle Clark books just keep getting better and better…. 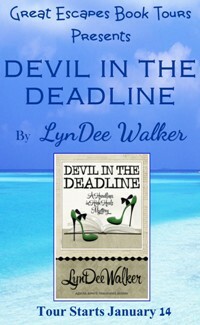 Lots of twists and turns in Devil in the Deadline. A good cozy mystery! Author Walker has a good writing style so the book flows. There is a lot of ground to cover in Devil in the Deadline, and Ms. Walker does a wonderful job of pacing the action, and I think our emotional reactions to characters and situations is just what she imagined it would be during the writing of this book. Lyndee Walker is a wonderful author and her books are incredible. …a good mystery…I like Nichelle and want to see more of her. LynDee Walker’s award-winning journalistic work has appeared in newspapers and magazines across the nation. Her debut novel, FRONT PAGE FATALITY, is an amazon and Barnes & Noble #1 bestseller, and was nominated for the Agatha Award for Best First Novel. 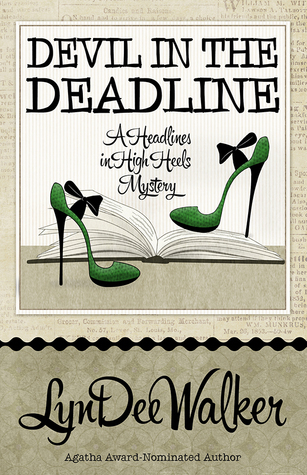 DEVIL IN THE DEADLINE is the fourth in LynDee’s Headlines in High Heels mystery series. The fifth arrives October 2015. LynDee adores her family, her readers, and enchiladas. She often works out tricky plot points while walking off the enchiladas. 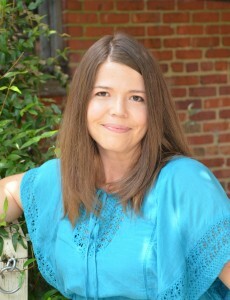 She lives in Richmond, Virginia, where she is either playing with her children, working on her next novel, or admiring beautiful shoes she can’t wear. Thanks so much for setting up another great tour, Lori! You’re an angel. Happy Holidays to you and yours! Devil in the deadline has almost 5 stars on Goodreads. I think I would like to read this book.